In 2013 we saw smartphone sales being higher than sales for regular mobile phones. At the same time, digital camera purchases were going down since the cameras that appeared in smartphones and similar mobile devices were suitable for the needs of the average user. Choosing between digital cameras and smartphones is becoming much more complicated than it used to be. Due to this fact, it is vital that you take the necessary time to choose something that is 100% suitable. That is a lot easier to do than what you would expect when you conduct a really good research. The infographic below can help you out a lot in making the choice a lot easier than you. 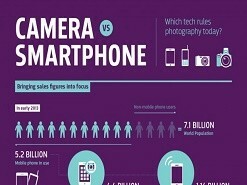 The Camera Vs Smartphone infographic you can see here is focused on photography. All the stats that are presented are of interest for those that are interested in buying a device that would be used in order to take photographs or videos. Statistics highlight the fact that the average person takes a little over 50 photographs every single year. That is quite a lot, especially when thinking about the fact that only 1 percent of the photos are nowadays taken with cameras that use regular films. Statistics highlighted in the infographic are tremendous and really well researched. That is why this infographic is considered as being one of the best ever created. You will learn about how many photographs are uploaded every single minute on social networks and you will see how many of the smartphone users take at least one picture every single month. To make the ingographic even more valuable, you will see details from a case study and you can even see how the journalists now use devices in order to take the photographs that are used. Make sure that you allow yourself some time in order to be able to go through the entire Camera Vs Smartphone infographic. It is a guarantee that you will have to invest a lot of time into this since there is a lot of information that is available for you there. If you want to, you can also save it on your computer.